Clouds are a key ingredient for a good sunset picture. 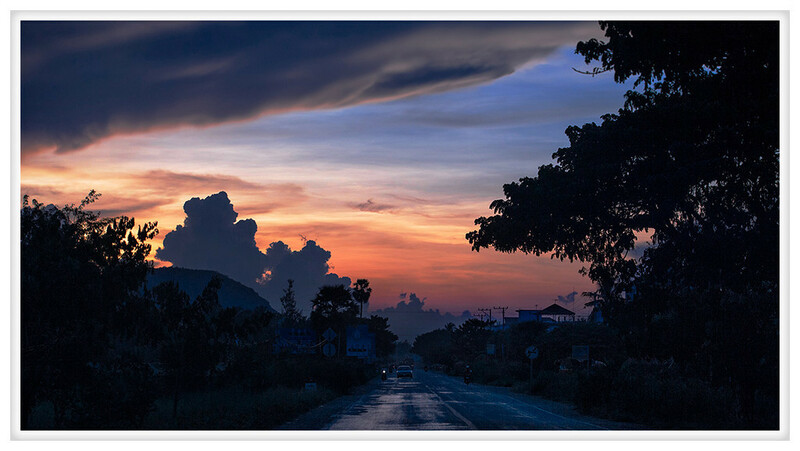 This was taken on the country roads outside Battambang in Cambodia. It has been a long day and our guide took us out of the city to watch the sun set over the rice paddies. The later it got the more dramatic the colors and this was taken out of the back of our van as we trundled back into town for dinner. Fortunately the sun was setting early, about 5:30 so it wasn't late and it gives an ample opportunity to capture the sun's descent even if you've spent the day running around in the heat to see the sights.